Apocalypse 4 Real: Mauna Loa CO2 at 400.46 ppm on December 7, 2014? It's Possible! 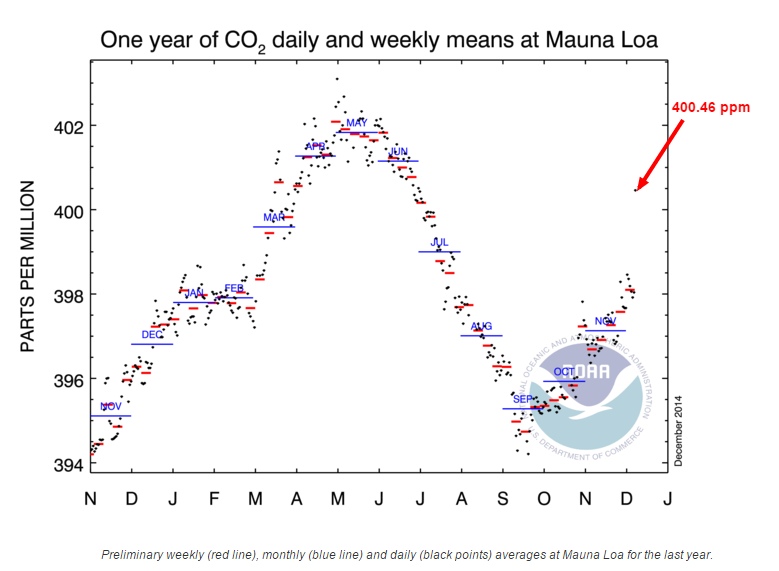 Mauna Loa CO2 at 400.46 ppm on December 7, 2014? It's Possible! The Earth System Research Laboratory (ESRL) published a preliminary carbon dioxide (CO2) reading go 400.46 ppm this afternoon. If it held, which I do not expect it will, it would be a jump of 2.42 ppm in one day, which is quite unusual. To illustrate the leap - here is the last year's CO2 cycle. This kind of abrupt change will place us above March, 2014's mean, with room to spare. While we might immediately dismiss this as an anomaly, perhaps another perspective may change that perception. Mauna Loa Observatory sits at 3,397 meters, or 11,145 feet asl. This is a rough equivalent to 650-666 mb of pressure, or layer 83 in the METOP IASI imagery. December 26, 2012, pm: This is the earliest METOP 2 CO2 imagery I've downloaded. Note the global CO2 level on that date was 393 ppm at 650 mb. Also, note almost no area was measured above a concentration of 410 ppm (yellow). December 7, 2013, pm: Last year's METOP 2 IASI CO2 portrays an increase of 3 ppm at 650 mb on that date - to 396 mb. Also, numerous areas now portray concentrations above 410 ppm, (yellow) especially in the Arctic. December 7, 2014, pm: Yesterday's MLO CO2 reading of 400.46 ppm is perhaps best understood with this perspective. The METOP 2 IASI CO2 at 650 mb was measured at 398 ppm, an increase of 2 ppm over 2013. While there are high concentrations of CO2 in the Arctic in 2014, similar to the prior year, what is now different are the increased areas of the Antarctic above 410 ppm (yellow). So what is the METOP 1 IASI readings for December 7, 2014 pm? The satellite image at 650 mb reveals a global mean methane of 400 mb. Areas near Hawaii are above 400 mb. Given this, it might be argued that areas around Mauna Loa did experience readings above 400 ppm yesterday. If so, it is sobering to speculate what the CO2 concentration highs will be in 2015 - 405? 406? Time will tell - but it is not trending downward. The CO2 # are bad but so are the methane levels, another very potent greenhouse gas now being released from the arctic ocean shelf & the tundra. The average reading for layer 80 is 1813ppb but the max is over 2371ppb. Each year it grows, ice is shrinking back to the pole, in a few years if not sooner, the arctic could be ice free by the end of summer. Even the local fishermen have noticed the ocean is warmer, ocean sunfish are being seen, as are leatherback turtles & billfish. The start of the crab season is bad again. The east coast of the US is in for another arctic winter thanks to the weaker & meandering jet stream. Will there be enough natural gas this winter or will we run out before the end of it? That's what I assume and I think CO2 was meant, not "methane".